This is not a complete set of instructions. You can read how to change a moped tire in most manuals. This is an additional item, very often overlooked that needs mentioning. Left, a tire has just been mounted on the rim. Before air is added, the area near the valve stem is checked. Sure enough, the tube is pinched between the tire and the rim. If ignored, this will cause a bulge in that area. Right, the same tire after pushing the valve stem up inside the tire. Now the tire will be straight when inflated. Pushing the valve stem inside the tire before the final mounting will also make the mounting easier, since the pinched inner tube is making the tire tighter on the rim on the opposite side. When your tires are mounted correctly, smooth roads will not feel like bumpy ones, and your bike will feel solid, smooth, and more enjoyable. It often happens that new moped tires do not automatically go on straight. Tires that fit tight offer increased safety because they stay on the rim during a flat. But a tight fitting tire is more difficult to install. The causes are almost never the tire itself. 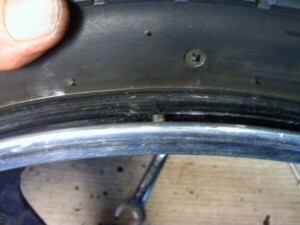 Here are possible causes of a “lumpy” tire. 1) The rim has tape or the rubber strip covering the sides where the tire seats at. The rim strip normally only covers the center of the rim. Remedy is to cut or remove the tape or strip from the sides, so it only covers the center. 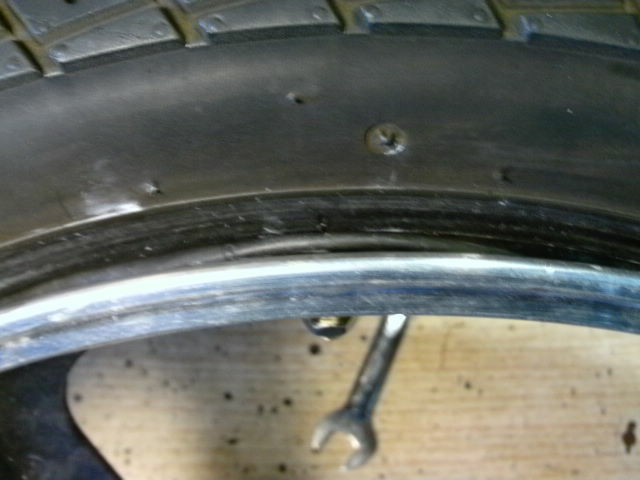 2) Part of the inner tube is pinched between the tire and the rim, usually at the valve stem. This happens when the valve stem is not pushed outward before first adding air. The inner tube under the tire makes it bulge at that spot. Remedy is to let the air out completely. Pull the tire back and look under it. The inner tube should not be visible. If it is, push it up inside the tire. 3) Some tires are stubborn and need help to climb up onto the rim seat. Remedy is lubrication and increased air pressure. With air out, squeeze and pull on the tire to shift it’s position. Then add air, and check the result. Often several tries are necessary. Sometimes at the shop we have to use up to 100 psi to “seat” a 35 psi tire. You are currently browsing the archives for the Tire Mounting category.